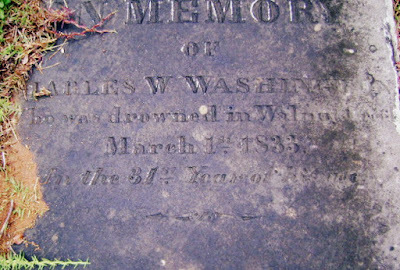 Charles W. Washington was born about 1802, possibly in Wilkes County, Georgia. I do not know the names of his parents, but I can tell you he had two brothers. Of the three, Charles was "the middle." Robert Beverly Washington was the elder brother, and James H. R. Washington the younger. 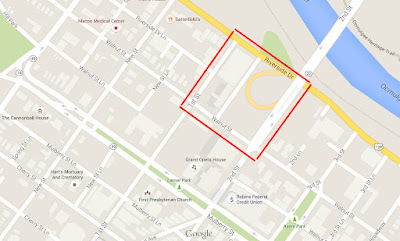 "Charles Washington opened the first mercantile establishment in East Macon, where the remains of the mounds are. He lived at the foot of one of those mounds...He owned ground from the Fifth Street bridge on the river to what is now Riverside Cemetery. Fast forward more than 200 years after the birth of Charles, when I am researching Macon's Old City Cemetery. Established in 1825, it was used by the city of Macon until 1840 when the more notorious Rose Hill Cemetery was opened. 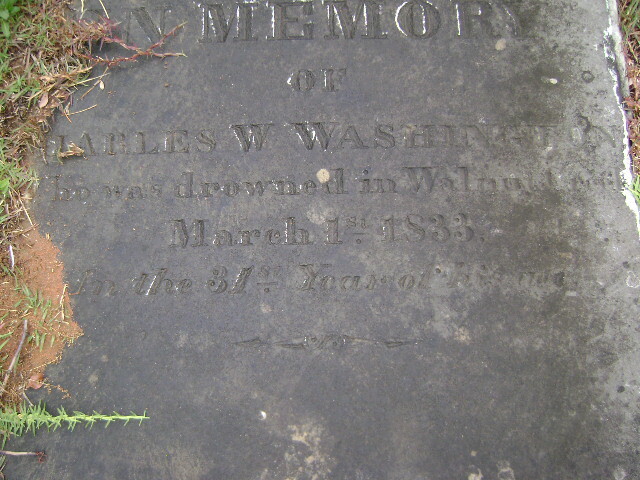 "To the memory of Charles W. Washington. Drowned in Walnut Creek March 1, 1833. Aged 31 years." "Uncle Charles lost his life in a tragic manner. He was on his way home from Savannah where he had gone on business. Of course, he was making the trip to Macon by stage. There had been a terrible freshet in his absence and the driver of the stage was unaware that the bridge over Walnut Creek had been washed away. Before he realized it, he had driven the stage into the swollen stream. The debris submerged the stage and before Charles could extricate himself he was drowned. 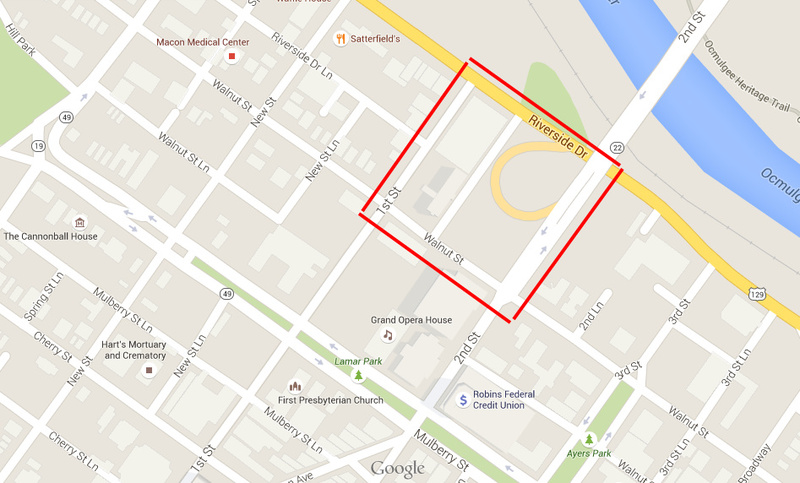 "He was buried in the old city cemetery, but I later had his body moved to Rose Hill to the family lot. He died in the full vigor of a useful life. There you have it. Several years before studying up on the Old City Cemetery, I had transcribed Charles' gravestone in Rose Hill Cemetery. I went back to my files, to be sure. Back when I was using pen and paper to transcribe cemeteries (imagine that!) -- and there the transcription was. Enhanced image. Original by James Allen. Since this is basically the same as the transcription found in the 1891 article about the Old City Cemetery, I wonder if it's the same stone first placed there? The savannah [sic] Georgian states, on the authority of a letter from Macon, that a violent tornado, accompanied with rain occurred in the latter place on the 2d inst. A good deal of damage was done by the blowing down of chimnies, houses and fences. One white boy and several horses and mules were killed by the falling of buildings. The Augusta stage was washed down, in attempting to cross Walnut Creek, and one passenger, Mr. Charles Washington of Macon, and 3 horses were drowned.